Many homes and businesses have experienced various amounts of water damage on their wooden floors at one time or another. Water pipes sometimes burst, or flooding may occur without warning and cause severe damage to a timber floor, but don't panic, in most cases the wood will not have completely absorbed the water too much, in which case the floor will perhaps not be completely ruined. This information may help you to understand what can be involved in the restoration of a wooden floor and explains why it is important for certain procedures to be carried out before a wood floor renovation team such as Floorfixer even arrives. 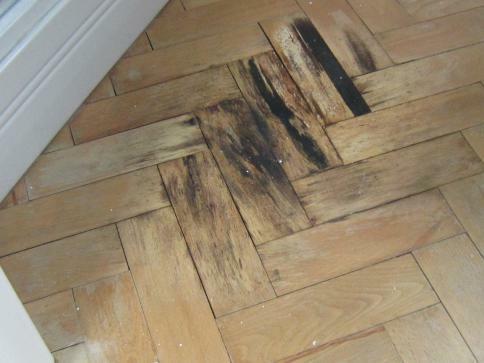 Extensive water damage on wooden flooring can result in becoming heavily buckled giving a warped or swollen appearance and in extreme cases (especially with Parquet floors) can even become partially detached from the subfloor. If the latter happens to be the case, the problem may also be associated with moisture saturation of a DPM (damp-proof membrane) beneath the screed. Water collecting on a membrane after saturation is difficult to dry-out naturally, and industrial sized fans or dehumidifiers may need to be blown across the floor surface to speed up the drying process. Being insulation material, the DPM is likely to lose its thermal and acoustic insulation properties through the effects of excess moisture, and may also need to be replaced. There are three categories of water-damage; the worst by far is caused by what is known as Black Water flooding which can include river flooding or coastal flooding and worst of all - a sewage leak containing harmful bacteria. The second type of damage is known as Unsanitary-Water damage which is mostly caused by toilet overflows. An example of such would be a toilet bowl which has leaked urine, or a sump pump failure. Water discharge from a dishwasher or washing machine also comes under this category because of the dirty water escaping onto the wooden floor. The third and most common classification does not pose a substantial threat to humans and is known as Sanitary-Water flooding where excessive clean water leakage has originated from pipes connected to washbasins, baths and sinks or white goods such as washing machines, dishwashers etc. which have been loosely connected directly from the mains supply, and then leaked onto the wood floor. Some flooding is the result of local drainage not being able to withstand vast amounts of rainwater which has fallen over a short period of time causing flash-floods from heavy storms. This may result in the entire ground floor becoming flooded very quickly, and the most important thing to do in this case is to try and drain the water out and ventilate the room as quickly as possible. A well fitted floor is far more likely to be able to withstand flooding than a floor which has been poorly installed, but no type of wood floor is without risk of becoming damaged through water leakage. The reason it is so important to ventilate the room and dry a wood floor quickly is not just to stop the timber from warping, it can also prevent mould growth. A water damaged wood floor is the perfect place for mould to grow. Toxic substances from fungal spores produced by mould can increase the risk respiratory illness. Inhaling or touching mould spores may cause an allergic reaction, such as sneezing, a runny nose, red eyes and skin blemishes. Some insurance companies may want to wait and see whether any water damage will remain permanently because dampness in wooden flooring can cause many associated structural problems in the building over time. It's also best to check a policy document wording, as your insurance may not cover the costs associated with all water damage or water damage restoration. While a common cause of residential water damage is often the failure of a simple connection, many insurance policies do not cover the associated costs of a more serious flooding problem without an addendum which obviously makes the insurance cover payments more expensive. Most Insurers insist on a couple of quotations before agreeing to pay for wood floor restoration but unfortunately there are many companies who will not be prepared to make a site visit. Floorfixer will always carry out an inspection before issuing a quotation, and during his visit for a water damage problem, our Surveyor will measure the floor MC (moisture content) to check the amount of moisture in the flooring. All wood floors naturally absorb moisture from the air when RH (relative humidity) rises. However, when RH falls, this same wood will emit moisture back into the air. This natural process helps to give wood its strength, but excessive MC can cause many problems also. Monitoring the room's temperature and RH level, then taking corrective action, can generally help to minimise any seasonal shifts in wooden flooring. Water and dampness can affect any type of wood flooring, whether it is solid wood flooring, parquet, engineered flooring or even laminate. Because of global climate change, flooding in the UK has become a national problem over the last few years in certain areas, and this water damage can turn out to be an expensive repair job to pay out for yourself if not insured. Whether insurance cover is in place or not, a rapid reaction can help if water is pumped out quickly, but a wooden floor can become entirely ruined if the room has been left completely flooded for some time. Damage can be caused to every part of a building when a natural disaster happens or a water pipe starts to leak, and flooding can especially cause very serious water damage to even the best laid wooden floor. The good news is that a water damaged wood floor may be repairable by the Floorfixer team; the main thing to remember is that Wood doesn't like Water. As for the subfloor - any new screed or concrete must be structurally sound, flat and completely dry with a suitable damp-proof membrane also installed before a wood floor is fitted. The length of time it takes for this substrate to dry out will depend on the depth as well as the environmental moisture levels which are affected by temperature and humidity in the room. At least one month must be allowed for every single inch of depth in new concrete or screed and problems can subsequently occur in the wood flooring if insufficient time is not given. The Floorfixer Surveyor can use up to three special electronic meters during a water-damaged floor inspection. The first is a handheld meter called a Tramex, which gives an accurate reading for the depth of concrete or screed by measuring moisture levels through its spring-loaded contact pins. The second type is called a Hydrometer which is an instrument giving a humidity reading throughout the room by measuring the moisture content in the atmosphere. The third instrument is called a Protimeter, which can measure the % MC (percentage of moisture content) in the actual floor timber. The biggest disadvantage with most common timbers used to lay wooden floors is that they are susceptible to high humidity levels. A wood floor's main disadvantage is that the structure of this common type of timber has a tendency to absorb moisture from the environment as it soaks up moisture like a sponge which then causes it to swell. When moisture gets into wood floorboards, they expand and become susceptible to cupping. However, floorboard cupping can be almost eliminated completely by the Floorfixer team, and crowning is only caused by sanding the floorboards flat too early. Crowning would not happen if the moisture levels had been checked initially during a Floorfixer survey inspection. Water leaks from a refrigerator or broken pipes on white goods such as a dishwasher or washing machine can cause moisture imbalances and high humidity in the wood. These imbalances make wood expand, and will in time produce what appears to be a naturally curved state. Cupping is a condition where a wooden floorboard becomes concave being high at the edges and dipping lower in the centre. This happens when the bottom of the floorboard remains more damp than the top surface. When cupping occurs, it's important not to rush quickly into sanding it level, all options must be considered before starting a renovation as it could cause the opposite affect - crowning. Crowning occurs when the surface edges of cupped floorboards are sanded-off too early. This makes each edge become lower than the rest of the floorboard as the flooring eventually returns to normal moisture levels. Sanding a floor to remove either cupping or crowning should only begin once drying measures are complete and normal moisture levels have been achieved. The Floorfixer surveyor uses a special water meter device to quantitatively test moisture levels before any problems like this are tackled. The most important thing is to ensure that a wooden floor is completely dry before attempting to sand it smooth and the finish is applied. Sometimes the entire surface of a swollen Parquet floor will expand and will severely rise up (see below) as it becomes detached from the subfloor it was originally secured to. 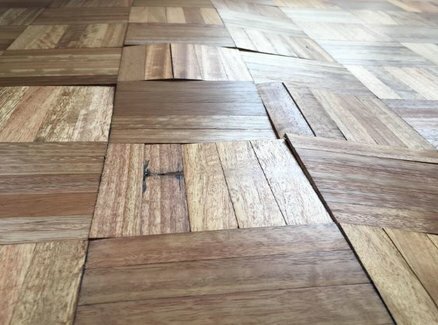 When each Parquet block swells by only a few millimetres due to dampness, it is very likely to create an overall expansion in this way throughout the entire floor. 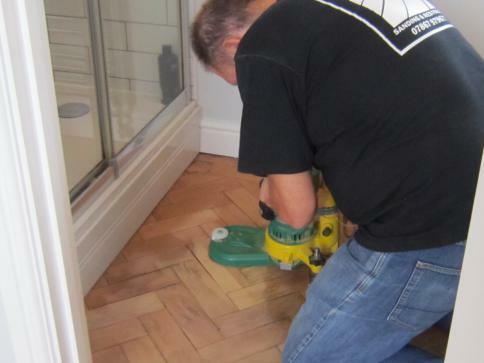 However, the drying-out process of swollen Parquet can be actually speeded up by removing the top layer of existing finish with coarse sandpaper on a belt-sanding machine. A commercial dehumidifier will then penetrate the bare wood far more rapidly if it is constantly left switched on in the room for a couple of weeks after our team has sanded the floor down to the bare wood.